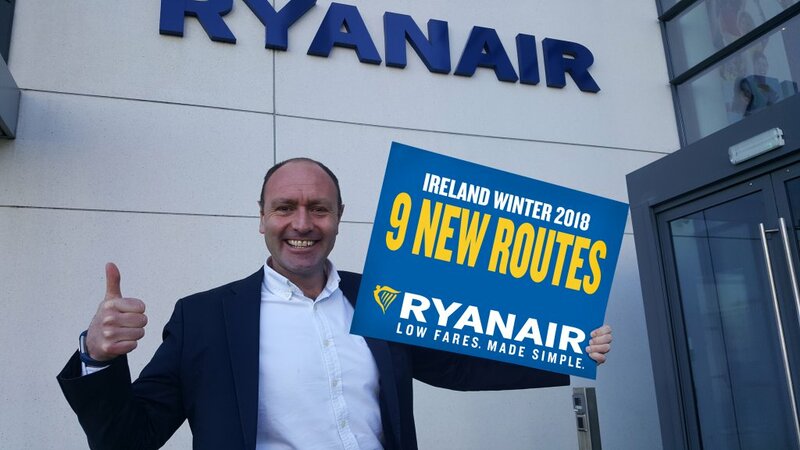 Ryanair, Europe’s No.1 airline, today (26 Feb) launched its Irish Winter 2018 schedule, with 9 new routes and more flights on 11 other routes, which will deliver 15.6m customers p.a. and support 11,700 jobs at Dublin, Shannon, Cork, Knock and Kerry airports, as Ryanair grows by 5% in Ireland. – 9,800* “on-site” jobs p.a. – 600* “on-site” jobs p.a. – 700* “on-site” jobs p.a. – 450* “on-site” jobs p.a. – 210* “on-site” jobs p.a. “We are pleased to launch our biggest ever Irish Winter 2018 schedule, which includes 9 new routes and more flights on 11 other routes, which will deliver 15.6 million customers p.a. and support 11,700 jobs at Dublin, Shannon, Cork, Knock and Kerry airports, as Ryanair grows by 5% in Ireland. Ryanair customers already spend €2 billion in Ireland, and this 5% growth in traffic will facilitate an additional €200 million in spending by international tourists.